The Iron Triangle of scope, schedule, and budget is fundamental to managing software delivery initiatives. Two general approaches are available for managing this aspect of delivery. With the traditional approach, we try to identify all needs, risks, and costs in advance and create a detailed, comprehensive plan before beginning development. With the adaptive approach, we begin with a vision for the product and incrementally evolve the solution based on feedback from stakeholders. Either way, we must deal with scope, schedule, and budget. However, the mechanisms we use are very different with each approach, and the metrics we can use to steer the initiative are different as well. There are two key factors to consider when choosing an adaptive or traditional approach to Iron Triangle management: Urgency and uncertainty. Generally speaking, when either urgency or uncertainty is high, an adaptive approach is called for. When both urgency and uncertainty are low, a traditional approach is called for. It’s only fair to say that the choice is not always obvious. Thor’s hammer had a name, so why can’t mine? 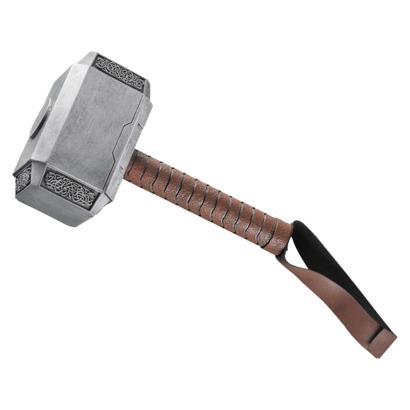 Thor’s hammer was called Mjölnir. Cool name for a problem-solving device. I completely understand why you have become disenchanted with word "Agile", but I am sticking with it for now. For the majority it’s still at least a starting point to have a pragmatic conversation about product development (not just software). I wonder about that. Is the word really a starting point for pragmatic conversation? Different people have had different experiences with that. My experience has been that people already have some pretty firm ideas about the implications of the word, "agile." A recurring pattern is that a change agent goes into an organization and happily proclaims, "Oh, boy! We’re going Agile!" To his/her surprise, the people in the organization do not react to the proposition joyfully. The word "agile" connotes Happy Things to the change agent. What does it connote to other people? Why are they not happy to hear it? Ron Jeffries’ classic article, We Tried Baseball and It Didn’t Work, suggests an answer. Continue reading Thor’s hammer had a name, so why can’t mine? This comment was posted on an earlier item entitled "Agile" considered harmful. I thought it was interesting enough to deserve a little more visibility than it would have as a comment, so I’m highlighting it in a separate post, along with my reply. We tend to make decisions based on emotion, intuition, gut feel, and wishful thinking. At the same time, we assume these are the wrong tools for decision-making. In our culture, there is a belief that all decisions and all conclusions must be based purely on logic, reason, science, or statistical evidence. It seems that people feel there is something wrong with conclusions or decisions that are arrived at by any means other than cold, calculating logic. (Never mind, for the moment, people’s demonstrated ability to apply logic.) There is an apparent desire to rid ourselves of emotion, morality, and even personal preference when making choices, even though this seems to be contrary to our nature. This assumption is so deeply ingrained in our culture that we have formally defined decision-making on any other basis as an error. We call it Base Rate Neglect (regarded as a cognitive bias) or Base Rate Fallacy (regarded as a logical fallacy). But which is the true fallacy: The use of non-logical decision-making methods, or the belief that such methods are to be eschewed categorically? In the past five months or so, I have been in on-again, off-again negotiations with a prospective client to participate in fairly large-scale organizational transformation initiative. The engagement would involve coaching, mentoring, training, consulting with management, travel to interesting cities, the chance to introduce effective methods to some 1,200 people, and the opportunity to work closely with some of the top people in the field. The agreed daily rate was just sufficient to cover expenses in the pricey home city of New York and still provide nominal income. Everyone involved was enthusiastic. We signed. I started to outlay cash to arrange for housing, and purchased the initial airline ticket. With less than 24 hours remaining until flight time, a new manager took over at the client company. He abruptly terminated the entire organizational improvement initiative and all associated contracts. This sort of thing happens from time to time. It isn’t the sudden reversal that caught my attention. Something else about the situation piqued my curiosity. It has nothing to do with the client, although one might justifiably question their handling of the matter. It has to do with the way I arrived at the decision to accept the engagement.